I feel really bad for the entire This American Life crew who were taken in by the story teller Mike Daisey and his fabricated monologue which morphed into a highly touted journalistic report. Ira Glass does a nice job of talking us through the retraction and as I listened to it, I could hear his anger and sadness for having been manipulated. It is all so easy to get manipulated like this when we are faced with some facts that force us to face something that we had hoped to keep hidden both from view and from our collective conscious. You can read more about what was true and what was story by listening to both of the radio podcasts aired by This American Life. I listened to both on my Apple iPod as I too am a conflicted soul. I love the shiny devices and want to believe that we can keep getting new versions while also having no downsides. That is the fundamental point of consumerism and if we stop believing this, we will both hurt our economy while also appearing to be anti something. Apple does make great products and folks who use them, (me included) love them. This is not a zero-sum game in that we need raw materials to make them that must come from somewhere by someone’s effort. Do we all think that every particle that goes into a digital device has no adverse side effects? Or is it that we no longer care or contemplate where our “stuff” comes from as all we can think about is the desire to have it and how soon can we get it? I have no answer to these questions, but believe we must give voice, like This American Life and Mike Daisey, have tried in their own way. We are all connected globally by these devices so I think we should connect mentally as well. When you get a new device that was manufactured by someone, think about what their life may be like. How it helps your life is important as well but not the only equation to consider. Apple is trying to both make great products while also improving the lives of workers who build the devices while trying to improve their lives. They are being more transparent with audit information. How about other vendors who also use Foxconn? How about the Chinese government? Jon Gruber of Daring Fireball does a great job of tearing apart Mike Daisey’s story and his recent admissions on how what he did is not so bad. We should also remember our history as this type of selective memory has happened before and will happen again. While trains are not what they used to be, they certainly changed the course of America in the 1850s. 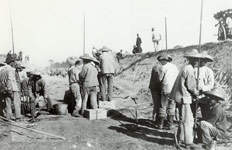 I seem to remember that even then we had Chinese workers doing some building for us.